Yeah so about that keeping up with the blogging comment. Sheesh! It’s been Over a week since I last blogged. Time flys when you’re having fun. So lets see…what have you missed…rode around Shipshawana and checked out the life of the Amish…seen a lot of beautiful and interesting scenery (been doing my best to post the pics on the FB page so you guys can see what I’m seeing)…made it to South Bend…was hosted by 2 wonderful sets of people…Quinn the mathematical poet and Frank the biologist kayaker. They were both awesome hosts. Quinn showed me around campus which was really cool and introduced me to the early bird special. Notre Dames campus is very scenic. It was cool to see some of the places I’ve seen in movies in real life. Then as sad as it always is, I left the home of the Irish and moved on to the Chicago area. Talk about love and kindness. I was lucky enough to meet two of the nicest people I’ve ever had the pleasure of meeting…Tom and Emilio. I met Emilio while I was resting and snacking at a park by McCool, IN. We got to talking and I noticed a Latin accent. Turns out he was from Venezuela. We chatted for a while. He later invited me to contact him if I should need anything. As I was on my way to meet up with Tom, it was good to know that I had another hosting option. We said our goodbyes and parted ways. Some time later I met up with Tom at a park, ironically just down the road from the park in which I met Emilio. Tom and I got to chatting and I could tell we were cut from the same cloth…he’s an adventurer at heart. We chatted for quite some time about traveling. He had some really great tips and resources that I made note to use. After a while of chatting, Tom was kind enough to drive me to Walmart so I could get some things…one of which was a sleeping bag. Up to this point, the nights I was camping, I was using a couple blankets I brought from home thinking that they would be enough. Boy was I wrong. I thought I would be staying ahead of the weather but it caught me fast. 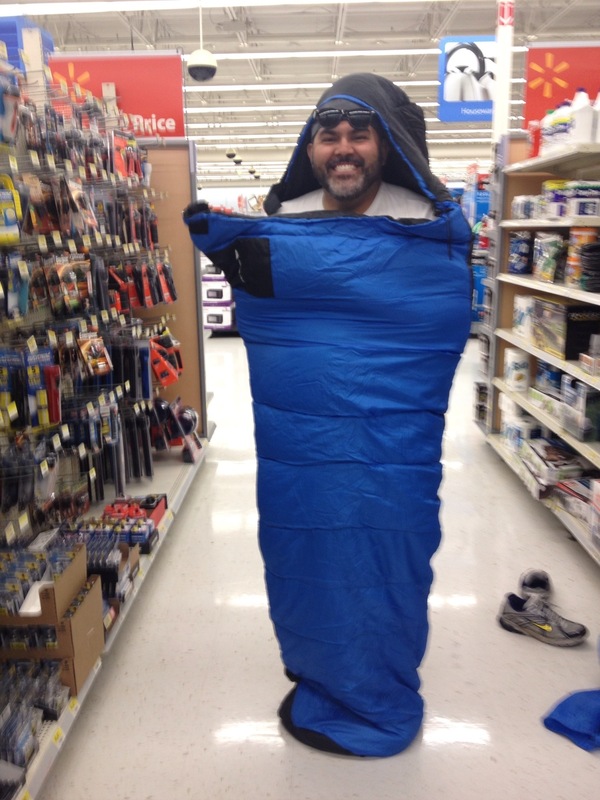 So I decided to get the sleeping bag to prevent anymore cold nights. After the Walmart trip, Tom drove us to his place right on Lake Michigan. Hands down one of the coolest beach houses I’ve seen. 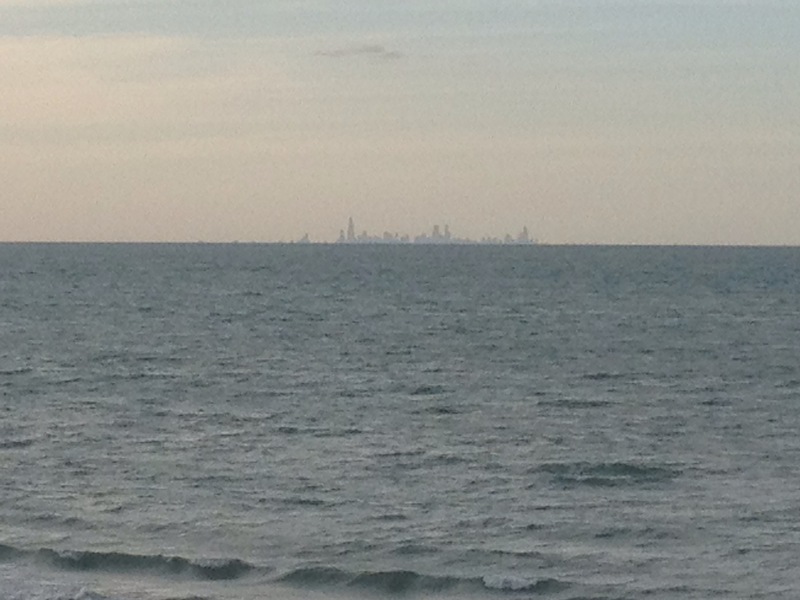 We were getting there just as the sun was starting to set and in the distance you could make out the Chicago skyline…absolutely awesome. Soon afterward we met up with some of his friends for dinner. Great group of people. The next day I met up with Emilio to hang out. We ended up going to Chicago for the day. He introduced me to an Arabic restaurant called Sultans where I tried my first falafel ever….AWESOME is all I can say. We walked around for most of the day. First time I really have gotten a chance to see the different boroughs up close. Chicago really has some beautiful architecture. I finished up my time in Chicago fabulously. I gained two new friends and saw some beautiful scenery. Now it was time to turn my sights to Normal…Illinois that is. About a week or so ago I posted my travel itinerary on CouchSurfing and was lucky to get an invitation from Doug. I was still quite a ways from him when we first connected but we had been staying in touch. I let him know at I would be arriving soon and he confirmed. But before I’d be able to surf with Doug…I had to get past all the Midwest wind that I had no clue about. All I can say is that the area surrounding Chicago is windy as a mofo. No wonder the nickname the Windy City. It’s so bad it had me to a near walk and in some areas it almost knocked me down and I swear its out to get me because it seems like no matter what direction I go, it’s blowing in my face. So you can imagine with this level of slow down I had to find a place to settle in on my way to the next destination. I found online a campground near Tinley Park called the Windy City campground. I’ve still been working on overcoming my fear of stealth camping and being that it was getting late in the day, I decided I’d go to the campground and stealth another day. I finally get to the location Apple Maps said the campground was supposed to be. It’s dark now and I couldn’t find any signs. A few days prior I upgraded my iPhone to the new OS not knowing that the Apple Maps App is total garbage. So I thought at first being dark and that I’m tired I was probably close. So I decided to ask for directions at a tobacco store. Turns out according to a guy who’s lived in the area for years, that campground was demolished years ago and he even pointed out an industrial office building that now stood in its place. It’s late…it’s dark…I’m tired…and now I’m really pissed without a place to sleep. I felt defeated. I so wanted to curl up and die. First time since I started this trip that I didn’t know what to do. I wandered around for a few minutes trying to gather my wits. I really couldn’t stay at a hotel as I budgeted no where near what the local ones ($125/night) cost. So I started to send out emergency couch surfing requests. To my dismay, there weren’t very many people in the area. So I sent out requests to the local people I could find…but it was late and my hope was diminishing fast that anyone would respond. I wandered around for what seemed like forever. My thought at this point turned to trying to find a local park or church to stealth camp at. Then suddenly…my phone rang. It was Lilly…a God send really. She was responding to my emergency surf request. I was so grateful at that moment. We talked one the phone for a few minutes and she was happy to help me out. Turns out she was 10 miles east of where I was located and in the wrong direction. She was East and I had been traveling West for most of the day (50 plus miles at this point). I was filled with new found energy. I was going to make it to Lilly’s. When I reached Lilly’s I was greeted by her and her mother…two of the most sparkling personalities I’ve met in some time. We chatted for some time. They were really great. They were so warm and accommodating that I felt at home. After some time of pleasant conversation, they showed me to my room. I slept like a baby that night. Next day I set my sights on Normal. I was now over 100 miles away. I ended up finding a campground, Fossil Rock, in Wilmington, IL. I got there pretty late in the day but was able to find an employee, Mark. He set me up with a great deal and I settled in for the night. It was an ok place. Only complaint is that my neighbors were up half the night arguing about their marriage. I mean really who goes camping to argue? I woke up in the morning and packed up my things. I was about 75 miles away from Normal and I communicated to Doug I’d be there in the evening. This would be the most mileage I’ve traveled in one day. I was up for the challenge…and it would be all that and then some. This is the day I hit a wall…several wind made…and an emotional one at that.